NZB Ready to Run Sale graduate Nashville (NZ) has confirmed his position as a rising star in New Zealand's racing ranks with a brilliant victory in today's $230,000 Group 2 8th Coupland's Bakeries Mile (1600m) at Riccarton. Trained by Adrian Bull, Nashville (Darci Brahma x Royal Kiss) is the second stakes winner in just five days for New Zealand Bloodstock's Ready to Run Sale of Two-Year-Olds which will be held next week on Tuesday 20 and Wednesday 21 November. Nashville had to be at the top of his game today in the Group 2 Coupland's Bakeries Mile, drawing barrier 14 and forced to race at the back of the field under jockey Kelly Myers. The widest runner coming into the straight, the four-year-old produced a powerful turn-of-foot to beat a top field of milers by a long neck. Coming close to stakes success last season at age three, Nashville came from the back of the field to run second to subsequent Cox Plate winner Ocean Park(Thorn Park) in the Group 3 Wellington Stakes. Nashville is the fifth stakes winner for his hot young sire Darci Brahma who has 14 two-year-olds in next week's Ready to Run Sale. Sire of the Group 1 winner Artistic, Darci Brahma is running hot at present with his son Darci be Good winning the Group 3 Hawkesbury Gold Cup in Australia last week. Bred and sold by Chesterfields Ltd, Nashville was purchased by Beamish Bloodstock at New Zealand Bloodstock's 2010 Ready to Run Sale for $40,000. He has now won five of his ten starts for just shy of $200,000. 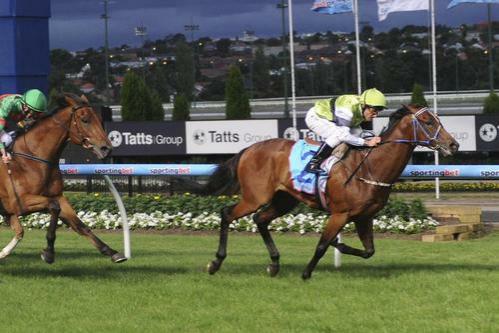 Delbridge Racing has two Darci Brahma's on our books with the promising Pakari Toa (pictured winning at Moonee Valley) resuming this Saturday 24th November and an unraced two-year old, Ahmabelleva, in work both with Mark Kavanagh.